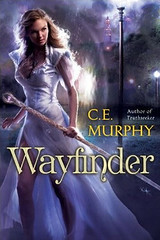 I just got a box of WAYFINDER advanced reader copies! I’ve never in my whole career gotten ARCs before! It’s very exciting! In celebration, I will give one away! Well, one on the mizkit propagations, anyway, which means it’s just one between mizkit.com and mizkit.livejournal, but DON’T BE GREEDY! Comment either at mizkit.com or mizkit.livejournal.com and I’ll draw a random number on Saturday and stick the book in the mail Monday! Way cool. I've been waiting for this one. And lo, you have won it! Please email your snailmail address to cemurphyauthor AT gmail DOT com! Oh please oh please!!! BTW, I'm LOVING Spirit Dances!!!!!!!!! Here's my comment to enter.